Universal Studios Minon Ride Review, Too much Hype or Worth the Lines? 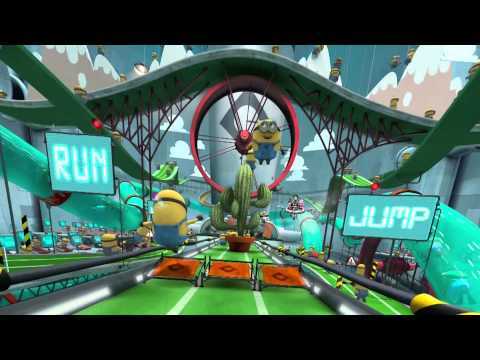 Universal Studios Minion Ride Review, Too much Hype or Worth the Lines? The new Despicable Me Minion Mayhem ride at the Universal Studios, Hollywood is based on the movie “The Despicable Me“. It made it’s debut this month (April 12) and trust Despicable Me fans to come out in large numbers to get the ride. Yours truly was there to bring you the juice and I will be telling you if the ride is too much hype or worth the long lines (and yes it had the longest lines of all the ride). 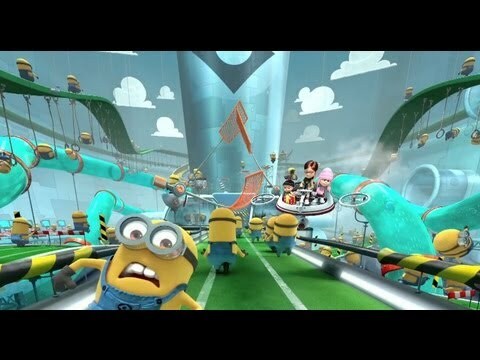 Experience Despicable Me Minion Mayhem and join Gru, his daughters and the mischievous Minions on a heartwarming and hilarious 3-D ride. Start your adventure in Gru’s home, where you’re recruited for his latest scheme – one where you’ll become an actual Minion. Like they said it is a 3D ride, which pretty much means the experience is simulated. The ride starts off with us in a room and a little introduction is given as prelude to the actual ride and in this intro we are “turned into” Minions (lol ok not physically). The animated characters (Gru, Agnes, Edith, Margo and some of the minions) come on the TV screen to “act out” what I like to call “leading”, which is pretty much a scene that leads to what will actually go on in the ride. It was cute but quite similar to how Shrek 4-D started but this time with us in a dungeon room and a story being acted out leading to what will go on on the ride. Let me divert a little, Shrek 4-D was an awesome simulated ride but is it me or the 3D glasses need improvement. The special effects like water being sprayed when you land on water or air being blown when the spider jumps at you (AWESOME!) to give us the effect of being there did more for me than the glasses. I guess I thought it felt so cool, I just wanted it to look “more real”. This was the same issue I had with the Minion ride. After being recruited as a “minion”, we are ushered in numbers of 4 into our seats and the ride starts taking us on a simulated roller coaster ride through the laboratory. We pretty much hit simulated twists, turns, bumps through the ride and till the end. Excitement level for me was a 7. Like I said, maybe if the 3D glasses gave an awesome 3D effect it would have been a 9 because the ride was super cool, just that I felt I wasn’t getting the full experience via the glasses. Now one cool part of the ride for me was actually after. When the ride is over you walk out through a room that has a “Minion Dance Party” going on on a big TV screen. Cameras are in place so you see yourself on the screen and you are free to party with minions before you exit. 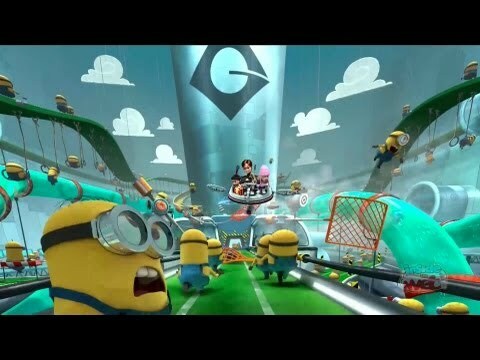 Trust us to get our groove on with the Minions for a bit before we took our exit. Now that part of the ride had me laughing all the way out. Now the question is, was the Minion ride worth the lines? I will say yes and if you have kids a double yes. The younger ones leaving the ride looked more than excited and I could hear a lot of “I wanna go again”. lol. As an adult I did enjoy the ride and probably would have enjoyed it more if the 3D glasses made it look even “more real.” Overall I will give the ride a 7.5 so if you are ever in Southern California and the Hollywood area you may want to give the ride a shot. FYI: The Simpsons ride, the Shrek 4-D ride and the King Kong 360 3-D (Part of the Tram Tour) are a must ride for Simulated rides. If you are at the park, try as much as possible to get all the rides in and then the shows. Plan accordingly around showtimes and best of all, enjoy your day. Love the review. Taking Devin next month.